The Alphaprints series of board books for toddlers present a touch and feel experience with Happy Dog and his furry friends. From the front cover, the googly eyes appeal to the reader to open the book, to discover and meet the 12 breeds of dog inside. 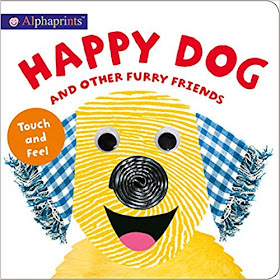 Accompanied by a funny rhyme, the dogs have fingerprint embossing which young children will love running their hands over. There are a few other textures to discover. The Golden Retriever has a fluffy hind leg, the Bulldog a felt tongue, and the Afghan Hound has a soft strip. Children can see what the various dogs look like. Most of them have happy, friendly faces; a few have fierce expressions. There are small dogs and big dogs; long dogs and fluffy-haired ones; chunky dogs and dogs that leap like gazelles. At the end of the book, all the dogs are gathered in two rows at the top and bottom of the double page, with their breed and temperament written beneath them. 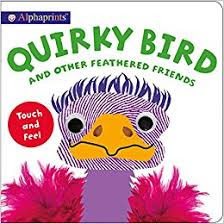 In the companion book Quirky Bird and other Feathered Friends, young children learn about 12 birds. The bird on the cover also has googly eyes, and eager hands will turn the page to view the brightly coloured feathered fliers in motion. A fluffy emu touch and feel, glossy peacock feathers, and a few bubbled features give in to the many fingerprint embossed characters. Both books are beautifully presented and the thick pages will add length to the book’s life. These two books are excellent learning resources. The layout and design is visually outstanding. It entertains while educating. I would have liked to see a few extra soft textures in both books creating a more tactile experience for our youngest readers.